FILE - Kurt Volker, U.S. special representative for Ukraine negotiations, speaks during an interview with Reuters in Kyiv, Oct. 28, 2017. Russian President Vladimir Putin last week told a gathering of diplomats in Moscow that he and Trump discussed the possibility of an internationally supervised referendum in pro-Russian separatist regions of eastern Ukraine, a claim later reiterated by the Kremlin's ambassador to the U.S. In an exclusive interview with VOA's Ukrainian service, Kurt Volker, U.S. special representative for Ukraine negotiations, said that Kremlin remarks about the referendum were not only misleading but also blatantly implausible. "There was no move toward recognition of Russia's claimed annexation of Crimea. No support for a referendum. No movement toward Russia's position on a protection force for [Organization for Security and Cooperation in Europe] monitors that would effectively divide the country," said Volker, referring to Russia's controversial September 2017 U.N. proposal. 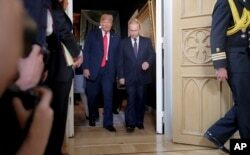 FILE - U.S. President Donald Trump and Russian President Vladimir Putin arrive for a one-on-one-meeting at the Presidential Palace in Helsinki, Finland, July 16, 2018. "Let me just say this — that on all of the issues that Ukrainians would care about, nothing was given away," he said. "No handing over of gifts to Russia at Ukraine's expense." Volker's comments supplemented initial reactions by Garrett Marquis, U.S. National Security Council spokesman, who said the White House was "not considering" supporting a referendum in eastern Ukraine, and a statement by U.S. State Department spokeswoman Heather Nauert, who said an eastern Ukraine referendum "would have no legitimacy." The comments by the trio of U.S. officials followed days of speculation about what was discussed at the rare one-on-one meeting between the U.S. and Russian leaders with only their translators present.